Map of League Teams in the SCSL – here. As I’m starting to run out of grounds close to my home at Step 6 and higher of non-league, I’ve started taking an interest in the Staffordshire League. This is three divisions running from Step seven to step nine. The reason I don’t ordinarily show an interest in Step seven or lower is that there are no FA requirements for grounds below step six. Step six is where a ground must have floodlights, hard standing round the pitch and at least 50 covered seats in one stand and able to accommodate at least 100 fans undercover in the ground. These are just a tiny few of the many requirements step six clubs must meet, and as you go up the pyramid the more rules you must adhere to as well as more seats and a greater capacity. Rules for steps 1-6 can be read here. So for a lot of Step seven clubs a pitch will do, and in a lot of cases that’s what you get. My interest in grounds lies largely with the stands and floodlights, but even at this level some of the grounds are quite charismatic, despite the bare essentials for playing a football match. Step seven clubs still have regulations to adhere to, but these are set by each league’s governing body. In the case of the Staffordshire County Senior League they require a perimeter bar of sound construction, hard standing on at least one side of the ground and generally adequate facilities for changing and trainers’ boxes etc. Full details can be read here (see 4th post down). The depth of quality football in England is quite astounding, given the size of the place. With 92 league clubs and a further 800+ at non-league level that require floodlights and proper stadiums, you would think they’d be no space, players or officials left for any other kind of football, but the clubs keep on coming with the number of leagues going up exponentially at step seven, and a good number of teams having respectable stadiums themselves. The Central Midlands League Supreme Division (Step seven) require floodlights for their clubs. It is a recommendation that grounds in the SCSL have at least one stand capable of holding 100 spectators. However, from the grounds I’ve seen there’s little evidence of this accept for the reserve teams who share their 1st team’s higher spec ground. Step 6 is quite a big jump in terms of what a team’s ground has to fulfil, which is why there are few promotions across this barrier. The last one from the Staffs CSL to the North West Counties was Eccleshall in 2002. Others that have gone up to Step six and beyond in recent years are Norton Utd (NWC2), Stone Dominoes (NWC2) and Meir KA (MidComb). In the 2007/08 season there are 17 clubs playing in the top division. There were 18 last year but Hanford folded, Stafford ‘A’ lost their funding and Stone Dominoes Reserves disappeared as Stone Dominoes themselves struggled to stay alive. Congleton Vale and Barlaston came up from the first division. This is another aspect of step seven and below that doesn’t appeal to me – having reserve sides playing. It just seems messy, especially looking at the league tables. In the SCSL there are five reserve teams at present – Newcastle Town, Alsager Town, Rocester, Norton and Eccleshall. They all play at their first team’s grounds, respectively The Lyme Valley Stadium, Wood Park, Hillsfield, Community Drive and Pershall Park. For pictures of Alsager, Rocester and Norton look in my A-Z list in the right column. Ashbourne Utd are by a fair distance the furthest out of the teams in the league. They were originally founded in 1954 as Brailsford and have played in the Derbyshire and Central Midlands League. The town is actually in Derbyshire, not Staffordshire, but they share Rocester’s Hillsfield ground, which is slightly nearer. 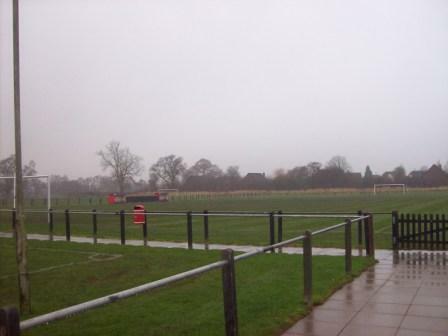 Barlaston AND Stallington share Stone Dominoes’ ground at Yarnfield, but before you worry about the disgusting state of the pitch and kick off clashes, Yarnfields is a big complex with four pitches, each with dugouts and perimeter bars. The Dominoes play on their newly floodlit pitch with 52 seater stand. Stone Old Alleynians, who did play in the Staffs County League but I believe now play in the West Midlands (Regional) League play on pitch one as you go in, Barlaston and Stallington share the use of pitch two and the smaller pitches are used for youth teams, including Port Vale’s. Stone Dominoes Reserves played there last season, too. 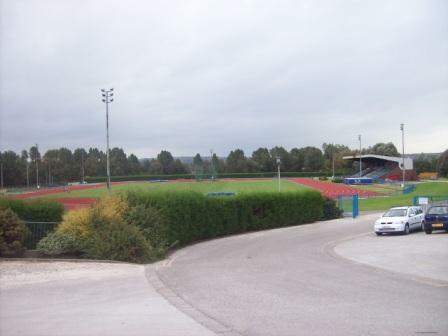 One of the pitches at Yarnfields – the one Barlaston and Stallington share. Barlaston and Stallington are both well-to-do small villages south of Stoke-on-Trent right on the border of the Borough of Stafford, near Stone. Barlaston FC used to be Wedgwood Sports & Social and played in Wedgwood, but changed their name last year. 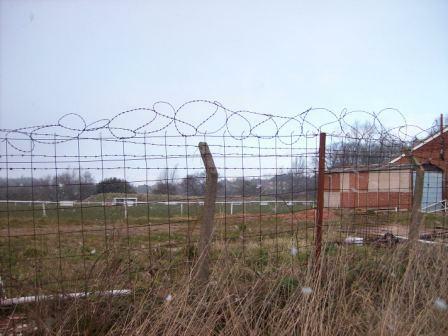 Stallington FC were founded in 1960 and used to play at Stallington Hospital, before moving to the Yarnfields complex. Congleton Vale played for many years at Back Lane on the outskirts of Congleton, but the facilities there were deemed unsuitable and they are now sharing Sandyford Cricket Club with Goldenhill Wanderers. They are busy trying to improve the facilities at Back Lane with a view to moving back (pardon the pun) in the near future. This leaves eight teams with their own grounds. Five of these are based in Stoke-on-Trent. Hanley Town, founded 1966, play just outside Hanley (Stoke-on-Trent’s commercial centre) in Bucknall off Abbey Lane, their ground name. They were runners up to Wolstanton Utd last year and champions the year before. They have ambitions to take the club forward in the near future by installing floodlights and making their home fit for step six. 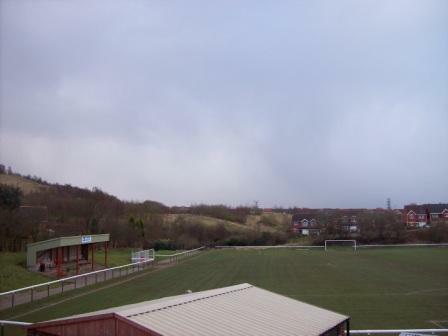 Abbey Hulton Utd, founded in 1947, are not far up the road going north, in Abbey Hulton – so named after an ancient abbey, the remains of which can still be seen today. Their ground lies just off the main road through the suburb, in Birches Head Road, which I believe is the name of the ground. Further north still you get to the Sandyford Cricket Club, the home of Goldenhill Wanderers, founded 1887!. Sandyford and Goldenhill are in the Tunstall area, Tunstall being the northern-most of the six towns. Going right back down to the south west of the city there are two more. Foley and Florence Colliery. Foley are so named after a district of East Fenton (Fenton being the least known of the six towns, due in large to the classic writer Arnold Bennett and his fictional ‘five towns’. *) Foley were founded in 1947. The area of Foley no longer seems to be marked on maps, but the name lives on in pub names and obviously in the football team. They play off Whitcombe Road further south east from Fenton in Meir. Their ground is very difficult to get near when they’re not playing. The ground is surrounded by high fencing and looks in a fairly bad state. However, it does have a natural slope on the near side and what may be terracing. There is certainly room enough to make a decent non-league venue, although parking could be a problem. There is also a corrugated stand that may have seats, though no more than about 15 by the size of it. Florence Colliery play not far away in the little area known as Florence, next to Dresden! Yes, an eclectic mix of Italianate and German influenced place names near Longton. Actually the colliery, which was first used in 1874, was named after the eldest daughter of the owner, The Duke of Sutherland. The club are the newest in the league, founded in 2001. They play at the Florence Sports & Leisure Centre, just off Lightwood Road. This is a very smart ground. A small stand houses a couple of benches and some seats. The pitch looks in good condition and it has a fine clubhouse and pub attached, providing excellent social facilities. This leaves three clubs remaining outside of Stoke-on-Trent. Redgate Clayton and Wolstanton Utd are Newcastle-under-Lyme teams and Ball Haye Green are based in Leek. Redgate Clayton, founded 1969, play in Clayton, far south of Newcastle. They play at Clayton Community Centre, off Northwood Lane, at a pitch that you can easily get on to at any time. There are no stands, just dugouts and the perimeter bar. However, the pitch looks in good condition and it is a smart venue. Right at the other end of Newcastle are the current champions Wolstanton Utd , founded 1946, who also look destined to become champions again with their games in hand over Newcastle Reserves and Ball Haye Green. They are named after the area of Newcastle, but the team plays in the neighbouring area of Bradwell at Bradwell Community Centre. Last up are another solid club who are usually in the top few places, Ball Haye Green. They are the oldest of the SCSL clubs, founded in 1880. They play near Leek town centre at Ball Haye Green Working Men’s Club. They apparently have fine facilities, and like Hanley Town are keen to progress to step six and beyond shortly. 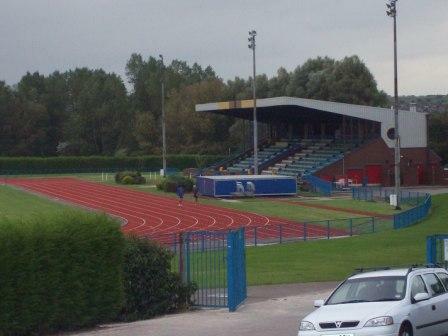 One of the best grounds used in the SCSL that isn’t the ground of a first team higher up the pyramid is the Northwood Stadium, an 8 lane 400m athletics track near the centre of the city, home of the City of Stoke Athletics Club. It has floodlights and a 750 seater covered stand. Northwood Town of Division One use it. 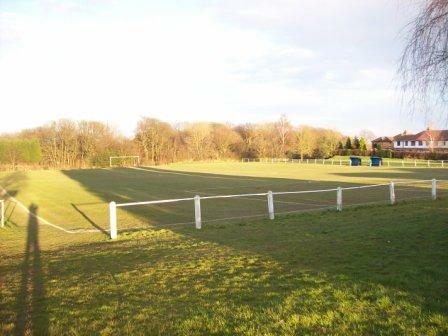 Hanford, who folded at the end of last season, also used it and before then, while Hanford were playing at Tunstall Road, home of Biddulph Victoria, it was used by Fegg Hayes FC, who have since folded themselves. Ground sharing can get very complicated at this level with teams hopping in and out of other’s grounds. In terms of seats and facilities the Northwood Stadium is the best in the League. Reserve sides shown in red font, Ground sharing teams shown in blue. Abbey Hulton United – Birches Head Road, Alsager Reserves – Wood Park, Ashbourne United – Hillsfield, Ball Haye Green – Ball Haye Green WMC, Barlaston – Yarnfields, Congleton Vale – Sandyford Cricket Club, Eccleshall – Pershall Park, Florence Colliery – Florence Sports and Leisure Centre, Foley – Whitcombe Road, Goldenhill Wanderers – Sandyford Cricket Club, Hanley Town – Abbey Lane, Newcastle Reserves – Lyme Valley Stadium, Norton FC – Community Drive, Redgate Clayton – Clayton Community Centre, Rocester – Hillsfield, Stallington – Yarnfields, Wolstanton United – Bradwell Community Centre. Despite the the exponential growth of the web, information on the SCSL is scarce, and it has been a struggle to find detailed information. Even the official site no longer has club information on it. However, some of the clubs do have fine websites, notably Hanley Town’s. Photos of the grounds of the SCSL clubs are perhaps even rarer. I aim to have photos of all clubs shortly. For now I am just missing Eccleshall and Newcastle, but will be attending first team games there soon. Of the others I am just missing pictures of Wolstanton Utd, Goldenhill Wanderers and Ball Haye Green. It would be good to have this page as a bit of a repository for information on the SCSL, so if anyone reading would like to contribute, either with extra information, photos, histories, corrections, updates contact me and I can add bits or make you an official contributor. There was no fictional Fenton such as Fenmoor. The Five Towns of Arnold Bennett were Turnhill, Bursley, Hanbridge, Knype and Longshaw. It is his fiction that has led to the myth that Stoke is comprised of just five towns. for extra information and corrections. This entry was posted in Football other, Non-League and tagged Non-League, Staffordshire, Staffs County Senior League, step 7. Bookmark the permalink. I am secretary of Norton United and do my best to keep the website for the League up to date- not easy when you have the club site as well. If can be of any assistance as you try to find more information about the Staffordshire County Senior League then feel free to ask. 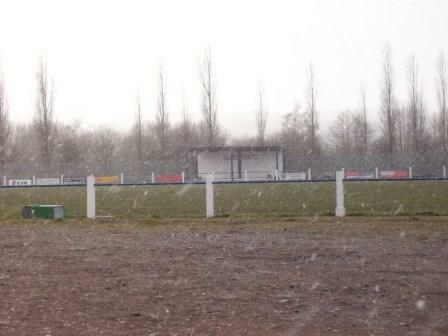 Stafford Rangers A folded because the club decided not to fund them. Stone Dominoes went because the Club very nearly went totally. Outstanding overview David. I never cease to be amazed by the incredible depth of non-league football in England. Also really enjoyed the map. Question – you mention clubs don’t always move up from this league to Step 6 because of ground requirements. Are teams regularly relegated down to this league from Step 6? No, teams are very rarely relegated at step 6. Basically if a team finishes bottom, they finish bottom and try to do better next season. There is no automatic relegation.The only reason they’d be relegated is if they failed some ground citerion or if they chose to demote themselves for other reasons. Teams at step 7 have to apply in advance for promotion to step 6(it might even be before the season starts) so the officials can check their ground out etc. They don’t necessarily have to finish top or even in the top half of their division; just be able to prove they have the ground and ambition for step 6. Most step 6 leagues have room for a few more teams so are quite flexible. Yes, it staggers me too the amount of teams in England – mind boggling! David – this is superb! very informative, well done. I know Foley looks a bit like a prison from the outside, but if you get the chance to visit the ground on a match day then you will see that it is a very good set up. A credit to some of the groundsmen in the scsl who do it voluntarily mostly and some of the pitches i played on in 2007 were brilliant. The Staffs County League (North) was where i learnt to be a referee. H&R Johnson was one of my favourite grounds where it was run by some lovely blokes and the tea lady. It was a great league to be involved in and I will never forget Wolstanton Marshes!! It was where Phil Dowd (Dowdy) started and I’m sure he will agree with me. what a good league it was. I enjoyed your article on the Staffs Senior League as I have refereed on all of the grounds concerned. 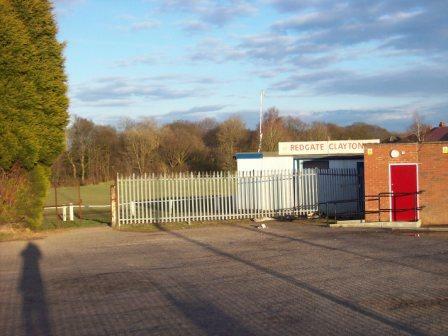 I have considered writing a a book on the non-league grounds of Staffordshire – do you think there would be an interest for this in the ground hopper community? Thanks for the comment. 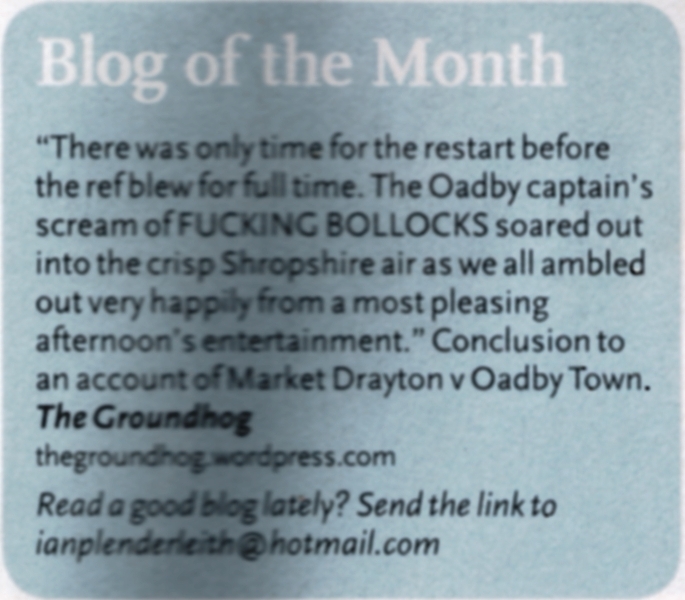 There would definitely be interest in the groundhopper community and also as Staffordshire interest. I can’t think of the publishers to hand, but you could try approaching the publishers who did ‘Dug-outs’ by David Bauckham and also Wick to Wembley by Andy Ollerenshaw and A Season of Sussex Soccer by David Bauckham again. I think as long as there would good pictures throughout it would be marketable. Let me know if you need any help and let me know how you get on with it.